The Kladno team started very physically with their play bordering the limits of fouls and they continued in this approach for the entire match, which they won by a goal scored in the 4th minute. The goal was scored by Strnad who hit the shot on the turn. The Mladá Boleslav team increased their pressure after the halftime break, but they failed to score a goal. Only Sylvestre hit the crossbar. Mladá Boleslav achieved an optical superiority, however the players were frequently inaccurate and toothless when shooting at goal. Kulič created the two best chances of the game. His 14th minute free kick found Chramosta in the goal area, however he failed to convert both his initial and follow-up effort. Ten minutes later Kulič won ball near the left side line, drove into the penalty area and passed the ball across the front of goal. The ball flew through the box half a meter out but no Mladá Boleslav player could get to it. After the halftime break, Mladá Boleslav increased the pressure and started playing harder. However forty five minutes of their efforts fell flat despite many chances to score and to reverse the unfavourable result. Zahustel had three headers in good positions. Chramosta unsuccessfully tried an acrobatic bicycle kick. Poláček hit the goalkeeper from the 6-yard line, after being played in by Kulič. However it was Sylvestre who came closest to scoring in the final minutes, crashing his shot against the crossbar from ten meters out after a pass from Táborský, before Kulič kicked the ball into the goalkeeper's arms with a kick from inside eight meters. Kladno only seriously threatened another goal in the 64th minute when Zachariáš, shortly after coming onto the pitch, failed to beat Miller from a difficult angl. With the match end drawing nearer, Mladá Boleslav's pressure was overwhelming and Kladno's luck endless. FK Mladá Boleslav team: Miller - Kalina (Tafat 83), Václav Procházka, Kúdela, Hrdlička - Zahustel (Bořil 86), Sylvestre, Opiela, Poláček - Kulič, Chramosta (Táborský 68). Janíček, Sedláček and Šeda were unused substitutes. Mendy and Rolko could not play due to disciplinary punishment. SK Kladno team: Tesař - Mráz, Beneš, Gross, Jan Procházka - Bartoš, Szabo, Zoubek (Lička 73), Strnad, Novotný - Šilhan (Zachariáš 62). 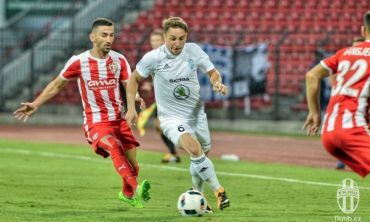 Cigánek, Tatanashvili, Hajník and Kostolanský were unused substitutes.